Project Bad A$$ is now in full swing and I haven’t cheated yet! Last night’s bootcamp workout was rough. If possible, I think I did even worse than I did the first time. Note to self: Time arm workout so that it’s not the night before aquatic bootcamp. The best news is that I made it to official rest day. Today is a day to gear up for tomorrow when I have double workouts. Bootcamp is bright and early at 7 am, followed with leg day at 10 am. Should make for an interesting start to the day and I’ll let you know how it goes. I’ve made an effort to stay off the scale this week so that I don’t end up derailing my efforts. Yes, I still have issues with the number on the scale as I think many of us do. Not so much the actual number itself. It’s more the direction the number goes that’s the problem. If the number goes up, I have a habit of throwing in the towel and falling completely off plan. Rolling in cookies, marshmallows, and anything else that I can get my hands on. Hence my post on things I should not keep in the house here. I’m making an effort to change my thinking on that. In my mind, eating healthy and exercising equate to the scale going down or at a very minimum not going up. I’m working hard on building muscle at this point and my trainer has warned me that the scale will go up, and I need to do some mental prep for it. That whirring sound you hear is my mind adjusting to this concept. When I started my journey just over a year ago, I weighed 138.5 lbs and was 24.7% body fat. This past Monday I was 138.4 lbs and 14.5% body fat. If I just looked at the scale, it’s a pretty disappointing picture with that .1 lb weight loss. Had that been the only thing I looked at, my journey would have ended before I even got off the starting blocks and think of all the things I would have missed! Stepping back there are several hidden victories mixed in that story. There is a huge difference in muscle, body composition (fat/muscle ratio), a 100 point drop in cholesterol, and 10 inches lost (over 4 of those in my waist alone!). Not to mention an added dose of confidence and pride thrown in that can’t be measured. It’s important to focus on those things instead of the scale. Since I’ve been so spot on the eating plan and working out this week, I fully expect a change when I go Monday to be weighed and measured. That change may be in inches or percentages instead of pounds. I definitely feel better and seem to have a ton of energy. I refuse to get on the scale before then and risk my motivation for something that really is all mental. It will take more some time and work to change this thinking, but in the meantime I’ll keep looking in the mirror and focusing on my awesome arms. 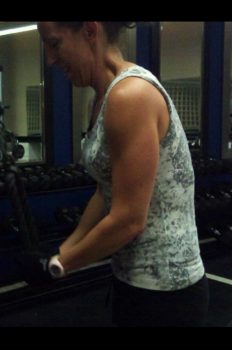 My triceps are coming along nicely and I promise they will no longer wave at you when I do. Keep this in mind during your own journey. The scale does not matter, the scale does not matter. I wish there was some magical way to turn off the scale watching. Even after all this time I still do it. Is it a female thing or do men also have this, I wonder? It’s nice to know I’m not alone.